So, in essence we have another example of Delta’s business acumen on show, following hot-on-the-heels from Jacks Point and Luggate. Delta ‘wins’ contract for Yaldhurst subdivision. There is no project manager, no overall master plan, and what subdivision designs there are do not comply with either NZTA or Christchurch City Council. (Perhaps this is the reason Delta ‘won’ the contract – no one else would bother to submit tenders on that sort of non-compliant set-up.) Warning light goes on, especially as neighbours are not happy with aspects of the development. Delta completes $4million of work, and instead of getting paid, settles for deferred payment by way of a secured loan, and happily continues on with more contracting work. Expecting what? Lots of fish hooks now plainly visible, caveats appearing, but Delta continues to throw plenty more good money at a bad project. From that point to now, they are owed $13 million, they have ceded their first mortgage security over their loan, and there is no guarantee they will ever get paid. 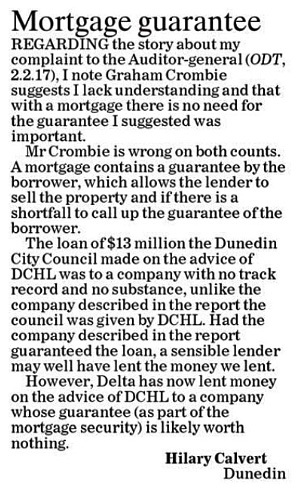 They (with Dunedin ratepayers’ money) have bankrolled a dodgy development, while BNZ as a late coming secondary lender has gained the first mortgage security. And Infinity Group will likely once again do more than ok. Extraordinary is one word for it. I can think of others. Management and governance both badly deficient. Just a couple more Aurora/Delta directors shuffle off quietly. And Grady Cameron’s large annual salary increases continue. Just how bad would things have to get under his watch before a nil increase was applied? It’s a cosy place to be at the DCHL. How many red tagged poles could be replaced with $13 million ? Mr Crombie says councillors were made aware that there were 2 “Infinities” – so council deliberately voted to go with the the one that’s NOT a success. Hilary Calvert was on council at the time wasn’t she, in any case she would have had access to records and talked with councillors who were there at the time – but she’s wrong, there was no confusion. *LOL* + *Pull the other one*, Mr Crombie. I’m wondering why “Success Infinity” was in the conversation at all, if not to give the impression that Delta wasn’t tying our finances to “FAIL Infinity”. Kind of like the 3 shell game would be if a naughty penguin had stolen one of the shells. Penguins Hype? Are you sure you didn’t mean ‘Ducks’? I think there are so many ducks here that one would need a machine gun to thin them out. Or a ballot. The plastic ones round council table hardly count, yet at the end of the day are the ones who will be accountable in a strange sort of way. Bit like, “err no sir I didn’t know what the hell he was talking about but I voted for his recommendations anyway.” What !! that’s not the way it is . No-one told me. Ain’t it a fact Hype. What? Hilary knows a thing or two about mortgages? “Bugger, why didn’t someone tell me that?” says rotund gent. Shouldn’t have made patronising – prat-ronising – response of hemi-semi-demi quavering factually fractured response to her previous letter to editor on the topic of Delta doing the bait & switch. You know, the one where Delta presented a company of good repute for general examination, then convinced councillors to sign up to a shockingly bad deal with a company of Very Similar Name – and very dissimilar (eugh, whiffy) reputation. Captured, Box Brownie style, Hype! If there was no need to secure a first mortgage over the Infinity Yaldhurst property, why was the BNZ insistent of having this security on its $5million loan facility – and why did Delta cede this 1st mortgage security that it previously already held on its $13 million loan? An unsecured loan of this size is extraordinary, but perhaps not in the world of Delta’s executive flash-harry salaries. Delta seen as a vulnerable, exposed and soft touch bunch of wallies in the subdivision game again. Dunedin City Holdings Limited has reported a surplus after tax of $4.9 million for the six months to December 2016, in line with budget. The recent trend of debt reduction has also continued during the financial period. Total debt for the group (which includes the Dunedin City Council) has decreased from $580 million at the end of June 2016 to $561 million at the end of December, a $19 million decrease. All companies within the group operated close to budget expectations. Aurora Energy Limited’s profit was in line with budget expectations. The profit was lower than previous periods as the company invested in higher levels of network maintenance and new network assets that are unfunded because of the company’s earnings being regulated as an electricity business. Following a report by Deloitte, operational changes are being made by Aurora and Delta Utility Services Limited, but these are not reflected in this reporting period. Delta’s surplus for the period was consistent with the previous year and in line with expectations. The company continues to provide a broad range of energy and environmental services to local authority and private sector customers. Strong domestic demand and steady exports, along with log export prices, favourable shipping costs and the exchange rate, were key factors for City Forests Limited this period. Forest production was below budget as a result of agreed changes to the clear fell plan and contractor schedules within the forest estate. This will be caught up by the end of the financial year. The net profit for the company was $3.5 million. Taieri Gorge Railway Limited was assisted by a slow but steady increase in tourist numbers. However, the late start to the cruise ship season and four cruise ship cancellations resulted in a loss which was larger than that for the same period the previous year. In December last year, Dunedin Venues Limited changed its name to Dunedin Stadium Property Limited to better reflect the operation of the company. It has reported a net loss of $3.2 million, compared to a loss of $4 million for the same period in 2015. This was largely due to a decrease in interest costs following the stadium review outcomes. Dunedin International Airport has performed strongly this period. A rise in operating revenue on the back of passenger numbers compared to operating expenses, along with a decrease in interest costs, lifted the overall financial performance. The outlook for the balance of the financial year is positive, with full year results expected to be close to budget. and a 50% share in Dunedin International Airport Ltd.
Half Year Result to 31 December 2016 not uploaded to webpage yet. Note the missing BILLION for Aurora upgrades, not mentioned by Crombie to wreck his postulating of DCHL/DCC health…. Not forgetting Crombie is part of the COMMERCE COMMISSION. How low can you sink for lack of openness and transparency, Mr Accountant Crombie ?!!!!!!! An amazing performance of sleight of hand. The debt reduces by $19million in six months, on top of the fact that it was so recently $623million and now $561million, a total reduction of $62million. This notwithstanding the fact that over $60million in subvention payments went from Aurora to the stadium in support of its debt servicing. DVL (now named Dunedin Stadium Property Ltd) is consistently posting deficits, as is DVML, which has just listed a loss of $3.2million as well. And yet, we are supposed to believe the fact that the claimed debt reduction of $62million is factual. Somebody pop a truth pill in their tea cup please. This is not only unbelievable, it is corrupt practice to deceive. I don’t know how these people sleep at night. Can someone tell us where the cash came from to repay the debt? Have they sold something? Two interesting articles in the ODT today. First the DCHL press release information reproduced pretty much ‘verbatim’ but presented as an independent report – which leaves a good deal to be desired – I don’t believe a word of it either. Second an article within which Terry Davies, the CEO of DVML, exhorts us that the cricket test that starts today is ‘not just about cricket’. How right he is! As I walk past this venue every day, I can see what has happened in the year or so since this ground disappeared into the DCHL fiscal hall of mirrors via a DVML management arrangement. There has been considerable work on the fixed assets of the ground. First the addition of the nearly new ex Foobar ‘big screen’, which presumably has been replaced by a new (even bigger?) one in the Foobar (thus this addition to the cricket ground can thus be treated as an ‘as new’ expense for DVML). To this can be added its housing – purchased once they ‘discovered’ that the ex-Foobar screen was not waterproof. Other visible additions include an expensive retained banking on the west side of the ground (very nice fancy stone retaining wall along the back of this – c. two yards high and maybe 100+ yards long). A similar bank on the East side running around the north side on both sides. No stone wall here, but the steep reverse sides of the now velvet turfed banks are all tastefully (and clearly expensively) fully planted with panels of different coloured grasses – plus steps etc – very nice. In the last couple of weeks a very hefty macrocarpa morticed post and rail fence has appeared around the top of all the banks. As my well-off neighbour has recently erected an identical spec. fence I know how much this stuff costs – and it’s pretty much as expensive as fencing gets – Nowt but t’best for our ‘Tel Boy’!!. I can only assume that much else that is pricey has been added to the ground in the year of DVML’s ‘stewardship’ that can’t be seen during a casual walk by. 1) A giant TV screen: so big that it had to be delivered by an articulated lorry (a nice new one that was parked outside) – presumably this in addition to the no-quite-so-giant screen noted above that is already in place. 2) A large scaffolding, uncovered ‘plebs?’ grandstand on the West side. This in addition to the covered stand that is already in place, plus the capacious, recently and expensively installed ‘plebs’ banks. 3) Next to this grandstand a large scaffolding platform, maybe 100 x 10 yards built behind the west bank and raised well above it, with a set of ‘imperial’ steps leading back down to the rear. 4) On this platform a long row of marquees. I presume that these are essentially temporary corporate boxes. For…well who knows, but maybe Dunedin Stadium Property Ltd (ex. DVL) Delta, Aurora, DCHL, DCTL and other local and independent commercial companies that desperately need to network to support revenue streams – and can thus fully justify the presumably considerable investment. 5. Behind this temporary rank of elevated corporate boxes, a large, elaborate and formidably enclosed ‘Tent City’, covering perhaps 1/2-3/4 of an acre for purposes unknown, but as the imperial staircase noted above leads into it, presumably for the purposes of supporting the networking that will be going on in the corporate boxes. It all looks very nice including not only tastefully arranged plants in pots, but quite large trees in pots as well, all arranged on the grass around the tents. I presume that these are rented, but who would know. 6…. I have no doubt that there’s lots more arrived that’s expensive, that can’t be seen on a casual walk past. Our ‘Tel Boy’ says in the ODT article that the test is “not just about cricket”. With this article’s report of only 5,000 tickets sold across the entire ground for the first four days and in the absence of any more cash from Aurora, he had better be right on that account in terms of revenue coming back into DVML to pay for all this stuff – both permanent and temporary. And he had better hope that neither rain nor batting collapses truncate the revenue stream – as they so easily could. The article also says that New Zealand Cricket are expecting a strong ‘walk up’ attendance. Well, they will certainly have to walk, and probably walk a long way. After all, ‘Tel Boy’ has poured all this money into a ground that sits in the middle of an area that is experiencing a parking crisis that has no resolution in sight. Although I work there, I did not even try to park in this area today. I parked up in NE Valley and walked some 2km to work (Clyde St). I did not see a single free park on the way at 8.30 am. Oh yes, one more thing – Has anybody found out where that recent Foobar temporary concrete road ‘investment’ went and who paid for it to come and go?